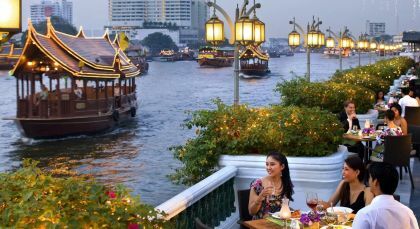 With this private Thailand vacation, discover the warm heart of the north. 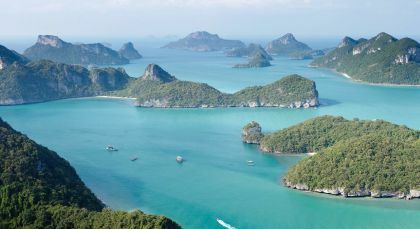 Set off for lesser-known destinations in northern Thailand to uncover historical treasures and vibrant, local cultures. Afterwards, spend downtime on the stunning beaches of Koh Samui, enjoying some sun and surf. Chiang Mai is the cultural capital of northern Thailand and is enveloped by a ring of mountains. 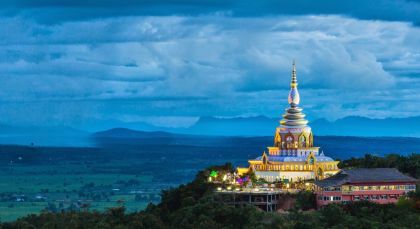 Explore the wonders of Chiang Mai by foot! Begin your walking tour of this charismatic city at the banks of Mae Ping River. At Warorot Market, you will be greeted by excited locals hunting for exotic culinary delights, colorful fruits and spices, and a variety of household staples. Walk down to the historic Tapae Gate and the Three Kings Monuments, before visiting Wat Chiang Man, which is the oldest temple in the region. Take a fortifying lunch break at a local restaurant, sampling local delicacies. Afterwards, drive up to Wat Phra That Doi Suthep, an iconic temple site in Northern Thailand. The climb up the famous Naga staircase offers spectacular photo opportunities of the city spread out below in all its glory. At the top, admire the enormous temple gong and unending row of temple bells. (Full Day; Private Activity & Transfer; Fitness Level: Easy; Please be suitably attired for temple visit with covered and loose fitting clothes – shorts, mini-skirts, tight fitting trousers, sleeveless shirts or vests, and sandals are not allowed inside the temple). Pai is a small and lively town in northwestern Thailand. Apart from its bustling market and wellness and yoga centers, Pai prides itself on the magnificent natural beauty around, also serving as an ideal base for trekking opportunities. 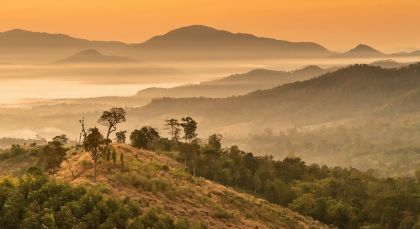 Discover the lush highlands of northern Thailand around the pretty little hilly town of Pai on this extended excursion. Drive over from Chiang Mai to Pai for a leisurely two-night trip and back. Day One: After an early breakfast at your hotel, drive up to Pai with your local guide. Enjoy your three and a half hour ride through winding roads amid a spectacular highland landscape of hills and valleys. Along the way, take a break at the Huay Nam Dang National Park, home to the beautiful Mok Fah Waterfall and Pong Duad Hot Spring. Make the most of the wonderful photo opportunities here and perhaps take a dip in the mineral rich spring. Rejuvenated by the legendary powers of the hot spring, make your way to the striking red sandstone Pai Canyon. The fiery stone catches the light beautifully at sunset, as you enjoy a delicious picnic at the canyon, in the lap of the Thai mountains. Stay overnight at your hotel in Pai. Day Two: After a hearty breakfast at your hotel, step out for an eventful day. Enjoy an hour-long drive through highland country to reach the spectacular network of caves and streams at Tham Lod. Explore the area in the best way possible – on local bamboo rafts that easily flow in and out of the caves. If your timing is right, you may even witness an unforgettable natural change of guard at the caves that takes place every afternoon. As flocks of swifts fly into the caves to roost for the night, an equally large battalion of bats leave them for their nocturnal rounds! Visit the nearby village of the local Lahu community at Jabo. Interact with the local villagers, learning more about their naturalist culture and unique way of life. On your way back to the hotel, stop by the Kiew Lom Viewpoint for grand views of the Eastern Himalayas stretched across the horizon. You could enjoy a sumptuous lunch along the way or back at the hotel. Spend your evening at leisure, mingling with fellow guests at your hotel or stepping out to explore the popular dining options in town. Stay overnight at Pai. Day Three: After breakfast, travel back to Chiang Mai over beautiful mountain roads. (2 Nights/3 Days; Private Activity & Transfer; Fitness Level: Moderate; Please bring comfortable walking shoes). Koh Samui, located off Thailand’s eastern coast, is an island oasis of natural beauty with its white sandy beaches, swaying coconut trees.